As the dim early light washed over the Appalachian countryside, Jason Kingsley began his climb up the side of an 80-foot silo. Kingsley was not a morning person. But he was also broke and unemployed. So when a dairy farmer named Ronald Wood called to ask him to help to rescue a piece of machinery that had accidentally been buried under tons of hay and legumes, Kingsley said yes. Not long before, Kingsley, 26, had been making good money in the Pennsylvania natural gas fields that dot the Marcellus Shale. But the work dried up, and he was forced to move back to his father’s house in the little town of Mansfield in the far north central part of the state. In the silo, Kingsley’s boots crunched on the mixture of wet hay and legumes used to feed Wood’s dairy cows. Wielding pitchforks, he and another worker, Eric Stone, tossed clumps of fodder to the bottom of a chute, where other workers removed the clumps and carted them away. Soon they were engulfed in stifling heat rising from the decaying plant matter, and dust pricked their lungs. Neither man was equipped with a respirator. There was no emergency plan or alternative escape route should something go wrong. And something had. Stone was the first to realize he was having trouble breathing. When he peered down the chute they had climbed to the top of the huge cylinder of fodder, he couldn’t see any daylight. The chute that had carried fresh air to the men was plugged tight. Kingsley and Stone took out their cellphones to call the men below. They weren’t panicking yet, but they needed to get out. Now. The workers below tried to clear the chute, but the compressed mass wouldn’t come loose. Sitting in the damp fodder, Stone’s heart filled with dread. The burning pressure in his chest was getting worse. Jason Kingsley, on the right, after a hunting outing with his uncle, Rex Kingsley. “It’s just an awful feeling, knowing that you’re losing all the air that you have and there’s nothing you can do about it,” Stone later recalled in an interview. He decided to climb down the chute and try kicking his way through the fodder. But as soon as he stood up he fell back down, dizzy from lack of oxygen. Kingsley then gave it a try, but quickly became helpless and disoriented. I can’t get out, Stone recalled him saying. Kingsley began counting and mumbling, then begged for help. Deep in the dark, airless chute, Stone heard him say he didn’t think he was going to make it. Then he fell silent. Driving by a short time later, Kingsley’s mother Denise passed a convoy of fire trucks leaving the farm. What, she wondered, could be going on at Ronald Wood’s place? Jason Kingsley’s death in June 2015 was not the first at a farm owned Ronald Wood. Two other employees had perished in previous accidents. Yet the federal Occupational Safety and Health Administration didn’t investigate Kingsley’s death, as it normally would after a workplace fatality. It was not allowed to do anything because of a fateful decision by Congress more than 40 years ago that has given small farms unique immunity from safety oversight. Over the last four decades, many hundreds of employees have been killed or seriously injured without follow-up investigations by OSHA because small farms are exempt from agency scrutiny. What’s more, because the exemption applies to all OSHA activities, agency inspectors also are barred from checking for hazards before injuries or deaths occur, and from responding to employee complaints about unsafe conditions. And while there is some evidence that small farms, on average, are more dangerous than other workplaces, OSHA isn’t allowed to provide the compliance advice to small farms it can give to other employers. In 1976, Congress attached a rider to the OSHA appropriation that has carried over into budget bills ever since. A short clause prohibits the use of federal funds for regulatory activities on a farm with 10 or fewer non-family workers. This is not a small category. About 93 percent of U.S. farms with outside employees meet that criteria, according to the latest U.S. census of agriculture, employing over 1.2 million workers. There is no official count of farm deaths that have been exempted from investigation since OSHA doesn’t keep track. But data from the federal Bureau of Labor Statistics show that, in a recent six-year period—2011 through 2016—333 employees were killed in accidents on farms with 10 or fewer employees. OSHA wouldn’t have followed up on any of these, though it’s possible a small number were investigated by inspectors from the few states that, on their own, monitor safety on small farms. Worker safety advocates like Tonya Ford, director of the United Support and Memorial for Workplace Fatalities, argue that the exemption from OSHA investigations has prevented any official accounting of how hundreds of farm workers lost their lives. “The OSHA inspection is important because it clarifies what happened that day, and how a company can prevent that from recurring,” Ford said. It also helps determine if the employer was reckless or negligent. After Allison Weston’s husband was killed in a 2016 grain bin accident in Nebraska, she learned through an OSHA investigation that his company previously had been cited for safety violations. It was a detail the company’s CEO failed to mention when they spoke after the accident, she said. “If OSHA was not involved with this, I really don’t think we would have ever gotten the true story,” she said. Despite numerous calls and emails, officials with the American Farm Bureau Federation, a leading agricultural industry lobbying group, did not respond to requests for an interview or comments. While OSHA is barred from inspecting small farms, state job safety agencies that could investigate for the most part don’t. Twenty-one states enforce safety standards at private job sites under agreements with OSHA. These states aren’t barred from inspecting small farms, provided they don’t use any of the federal funds they get from OSHA. But in practice only three of them—California, Oregon and Washington—regularly do such inspections. Others follow federal OSHA’s lead and steer clear of small farms, with rare exceptions. For example, Michigan’s job safety agency is allowed to conduct inspections under certain circumstances. But from July 2014 through August of this year, the state conducted just two small farm inspections, both after fatal accidents, according to a state official. During roughly the same period, California inspectors investigated 68 accidents, 18 fatalities, and 107 employee complaints, while Oregon inspected 1,572 accidents and safety complaints, according to data provided by state officials. The appropriations rider also prevents the use of federal funds for training or advice to small farms, which frustrates some OSHA officials who want to help farmers comply with safety standards. Farms of all sizes have always been treated differently than other businesses under the federal Occupational Safety and Health Act. 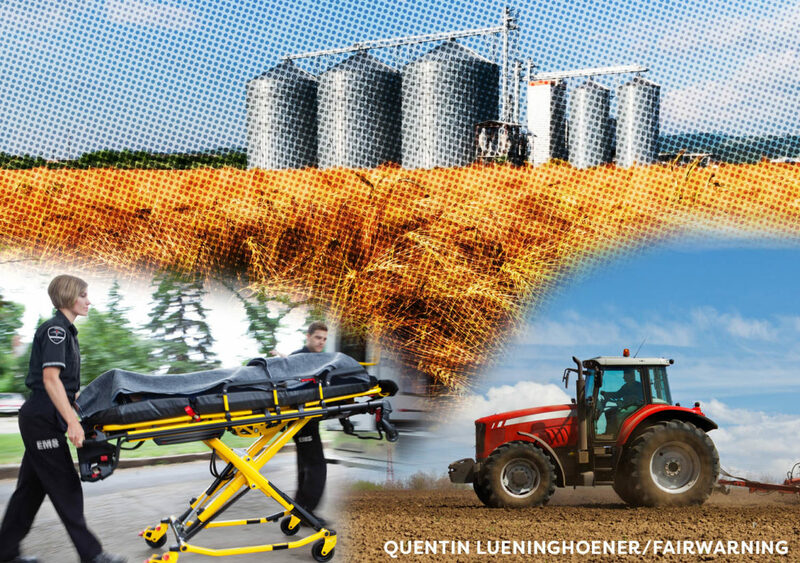 Farm owners often employ family members, and injuries and deaths suffered by owners and immediate family members are not covered by OSHA on farms large or small. In all, 1,807 deaths occurred on small farms from 2011 through 2016, according to data from the Bureau of Labor Statistics, many involving owners and family members. A study by researchers from the National Institute for Occupational Safety and Health concluded that fatalities on small farms would decline if the exemption were lifted. The study found that states that allowed safety inspectors on small farms—California, Oregon and Washington — boasted significantly lower farm worker death rates than other states. There’s also evidence that the larger farms covered by OSHA generally do more to prevent injuries. A survey by the Department of Labor found that that workers on farms with 11 or more employees were far more likely to have protective equipment, such as safety goggles and respirators, than their peers on smaller farms. The study was conducted in 1999, and more recent surveys have not correlated safety data with farm size. Among those deeply frustrated by the exemption is Carly Fox, a staff member of the New York Worker Justice Center, an advocacy group. She and her colleagues helped convince OSHA to establish a so-called “Local Emphasis Program” to address the alarming toll of worker deaths on New York dairy farms. The program has been heralded as a success in some corners. But Fox noted that roughly 80 percent of New York dairy workers are employed on farms too small to fall under OSHA’s jurisdiction. The New York State Department of Health reported 34 fatalities on dairy farms from 2007 to 2012. But according to a report, OSHA only followed up with four. Jordan Barab, former deputy assistant secretary for OSHA, argues that Congress is saying it “doesn’t really care whether workers get killed on small farms or not” by keeping a safety oversight exemption for small farm businesses. A number of those deaths have involved migrant workers. Fox described an incident in 2013 when a Mexican worker named Francisco Ortiz Garcia died on an Ithaca dairy farm after becoming entangled in farm equipment. His employer, Sweyolakan Dairy Farm, was deemed too small for an OSHA investigation, according to agency records. The owners of the Sweyolakan Dairy Farm could not be reached for comment. Congress could easily amend the small farm exemption in their review of OSHA’s annual budget. But in 42 years, it appears to have been questioned just once. In 1999, following the death of a teenager on a Rhode Island farm, Sen. Jack Reed (D-R.I.) introduced an amendment to allow OSHA to investigate fatal accidents on all farms, regardless of size, if the victims were children. During a Senate session, Reed was at pains to stress that the amendment was limited, and still wouldn’t permit OSHA to levy fines or investigate the deaths of children of farm families. It would only allow OSHA to determine the cause of an accident, Reed explained, giving farmers information they could use to prevent future tragedies. But Reed wound up withdrawing the proposal, recognizing it wouldn’t pass. The exemption is such a third-rail issue that any perceived threat to it can set off volatile protest from agricultural interests. In 2013, a group of 42 senators blasted OSHA in a letter to Secretary of Labor Thomas E. Perez after learning the agency had cited a Nebraska grain bin operation for safety violations. The grain bin was on a farm that had fewer than 11 employees, but OSHA had relied on a legal opinion that it had jurisdiction over post-harvest activities on farms. The agency was trying to address an alarming rash of deaths at grain storage sites. The Department of Labor noted that as a result of OSHA’s education and enforcement efforts, cases of worker entrapment at grain storage sites had decreased by two-thirds over a three-year period. Some safety advocates agree with keeping OSHA away from small farms. Jason Weston was killed in a 2016 grain bin accident in Nebraska. His wife learned later on, through a government investigation, that the employer was cited previously for safety violations. Marsha Salzwedel, an agriculture youth safety specialist with the National Children’s Center for Rural and Agricultural Health, believes that voluntary measures, not government regulations, work best. Her organization has developed youth work guidelines that Salzwedel said can reduce farm accidents through simple protocols, like giving children work that is appropriate for their age. She also touted state child labor laws as effective tools for enforcing safety standards. “There are numerous cases of youth that are under 16 who got injured or killed, and where, if they’re hired, child labor laws do apply,” Salzwedel said, adding that those laws apply regardless of a farm’s size. Accident victims and their families can also cite violation of OSHA standards in civil lawsuits against small farms, though there is no guarantee a judge will allow this into evidence. “We have judges in this country who have no respect at all for the mandate of OSHA, or its intent to provide safer and healthier workplaces,” said Purdue University professor William Field. Field, who has testified for plaintiffs and defendants in over 100 farm injury cases, described one colorful incident in which the judge in an injury case cleared the court and told Field that “this state didn’t do OSHA.’” To emphasize he was serious, the judge threatened Field with a night in jail if he brought up OSHA standards again in front of the jury. Field declined to name the case or the judge, saying only it happened in a conservative western state. In a separate case, Brandon Mullen’s parents filed a wrongful death suit after he was killed in a grain bin accident in 2013. But the judge rejected the parents’ claim of gross negligence, and ruled that workers compensation was their only possible remedy. The small farm where he died was exempt from an OSHA inspection, but Brandon’s father, Charles Mullen, said he saw ample evidence of negligence, including the fact that his son was working in the bin alone and without a fall harness. Denied a chance to take the employer to court and unable to bring OSHA onto the farm, Mullen turned to state politicians, hoping for legislation that would prevent more grain bin accidents. Mullen said state senators he talked to expressed sympathy, but none would pursue legislation. As for the OSHA exemption, Brandon’s brother Jordan Mullen said it served as an ugly reminder that farmers matter more than the workers they employ. Francisco Ortiz Garcia, a Mexican migrant worker, died on an Ithaca, N.Y., dairy farm in 2013 after becoming entangled in a piece of farm equipment. His employer was deemed too small to investigate. “Basically, the laws don’t apply to them,” he said. It’s a feeling echoed by John and Denise Kingsley, who struggle to understand why Ronald Wood, the owner of the farm in north central Pennsylvania where their son, Jason, died, wasn’t held accountable. According to OSHA rules, an employer must report the death of a worker within eight hours. Wood didn’t report Kingsley’s death—later telling OSHA officials he thought state police would report it, according to agency records. OSHA learned about the death through a complaint, and then determined that the farm had fewer than 11 employees and was exempt from inspection. OSHA officials, agency records showed, then learned of another fatal accident a year earlier that Wood hadn’t reported. It occurred in July 2014, when Wood’s nephew was crushed by a tractor. A spokesperson said OSHA confirmed that Wood also had fewer than 11 employees at the time of the 2014 death. Ordinarily, a failure to report a death within eight hours can bring a citation and penalty of up to $7,000. But since OSHA was prohibited from taking enforcement action involving small farms, there were no consequences for the two unreported deaths, according to a spokesperson. A third employee was killed on a farm co-owned by Wood and his brother, but when it happened in 2006 they were not under the 11-employee threshold, and therefore were investigated by OSHA. That victim died when he became entangled in machinery that lacked a protective guard. FairWarning reached Wood by phone, and after a brief conversation in which he blamed a co-worker for the Kingsley death, he abruptly ended the call. He could not be reached in follow-up calls, and he did not respond to a letter with questions about the three fatal accidents. A report on the 2006 fatality that FairWarning obtained from OSHA under the Freedom of Information Act described a “disturbing” pattern of reckless disregard for worker safety on the farm. The inspector noted that Wood had his employees routinely work with damaged, dangerous equipment, which continued even after the worker was killed. Wood and his brother told investigators they were aware that OSHA required guards on equipment. The agency initially proposed penalties of $26,600 for six serious safety violations, later reducing the penalty to $8,400. When OSHA returned for a follow-up inspection a year later, it discovered more unguarded machinery and fined Wood $4,000 for this repeat violation. Wood received another citation in 2012 when OSHA found that he was still exposing workers to unguarded machinery. Wood’s poor track record made no difference once the agency determined that Wood had fewer than 11 employees at the time of Kingsley’s death. After the Kingsleys accused him of negligence in a wrongful death suit, Wood testified in a deposition that he didn’t train employees on how to work safely in silos, or provide them with safety equipment. Wood also seemed hazy on the specific dangers of working in confined space. Asked by counsel if the accident could have been prevented, Wood pleaded ignorance. “I have many scenarios that I think sometimes why didn’t I do this or why did he do this or why didn’t they do this and none of them come up the right answer,” Wood said, according to a transcript. The case ended in an undisclosed settlement in 2017. But Kingsley’s family is still recovering from the trauma of Jason’s death. His mother, Denise, struggles to talk about Jason, remembering how as a child he was drawn to the outdoors and working with machines, but that school never held much interest for him. He seemed so close to finding himself just before the accident, she said. Jason’s sister Rachel remembers her brother as sweet and a little bit goofy. “He had a knack for seeing when someone needed something… He would just randomly show up to fill that need,” she said. Despite the death of his son and others, John Kingsley doesn’t expect to see much change. Agriculture is “such a big, powerful lobbying industry and there’s a lot of senators and stuff that their political futures ride on it,” he said.